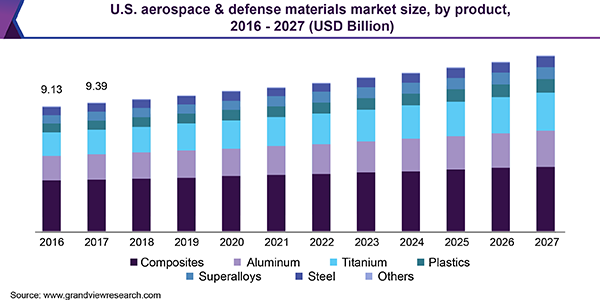 Aerospace and Defense Materials Market Value To Reach $27.44 Billion By 2025: Grand View Research, Inc.
San Francisco, United States, 2018-Sep-24 — /EPR Network/ —The global aerospace & defense materials market size is estimated to reach USD 27.44 billion by 2025, according to a new report by Grand View Research, Inc., exhibiting a CAGR of 4.3% during the forecast period. Increasing demand for lightweight materials in order to reduce the weight and increase fuel efficiency of an aircraft is projected to boost market growth. The aerospace & defense materials market exhibits low competitive rivalry due to limited number of players offering suitable products to aircraft manufacturers. Moreover, aircraft manufacturers prefer to enter in long-term supply agreements with reliable material suppliers, thereby further reducing the competitive rivalry. Price of materials, such as aluminum, is influenced by growing exports of products from China. Furthermore, spiraling demand for aluminum due to dynamic growth of the building & construction industry in developing economies is poised to have a notable impact on prices. Air Transport Association (ATA) introduced emission policy options in 2010 to reduce aircraft emissions in order to protect the environment. This has encouraged aircraft manufacturing companies to incorporate lightweight materials into structure to reduce overall weight and increase fuel efficiency. Industry participants in North America and Europe are anticipated to face disruptive competition due to emerging players in Asia, especially China and Japan, which are offering comparatively low-cost material solutions. Material manufacturers are investing significantly in research & development to provide high strength and lightweight materials at competitive costs.